The photographic materials that you use to record images deserve the same kind of care and attention as other valuable objects. Before you expose film or paper, you must store and handle it properly so that it can provide the finest possible results. After exposure, proper care in processing and in storing or displaying the negative, slide, transparency, or print helps to preserve the long-term usefulness of the image. Unprocessed photographic films and papers are perishable products that can be damaged by high temperatures and high relative humidities. Some photographic characteristics—speed, contrast, color balance, and fog level—change gradually after manufacture. Adverse storage conditions accelerate these changes. Color materials are more seriously affected than black-and-white materials because adverse conditions usually affect the emulsion layers to different degrees. For best results, always use film before the expiration date printed on the package. You can store Kodak color films, at temperatures up to 70/ 21°. However, you must keep all films away from places where they are subject to excessive heat, such as a car parked in the sun, or an attic during the summer. The glove compartment, trunk, and back window of a car in the sun become very hot on a warm day. If you carry film in a car in warm weather, keep it in an insulated bag or cooler. We recommend that you store KODAK PROFESSIONAL color films in their original sealed packaging under refrigeration at 13°C (55°F) or lower to maintain consistent performance. 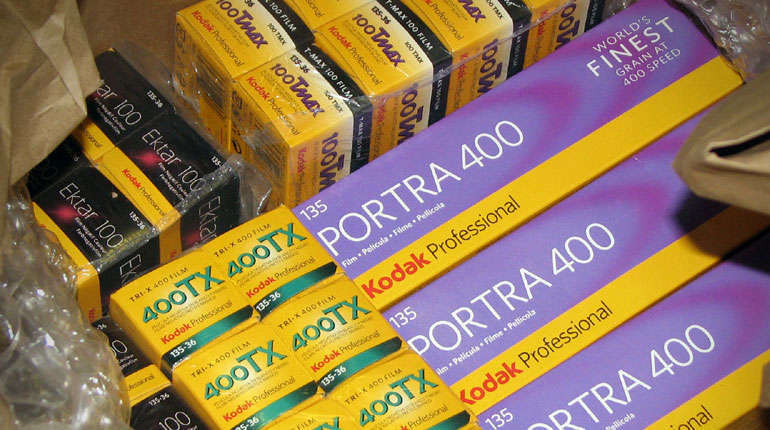 Store KODAK color papers and display materials at 13°C (55°F) or lower in their original sealed packages. To prevent condensation on the surfaces of film taken from a refrigerator or freezer, allow the package to warm up to room temperature before breaking the seal or opening the container. 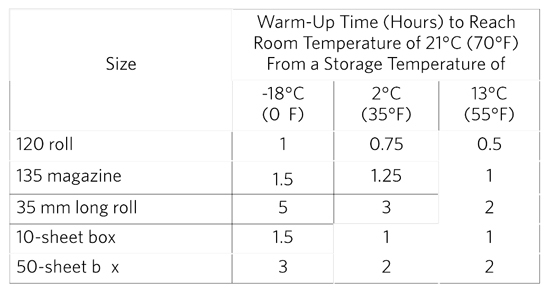 Warm-up times vary with the amount of material, the type of package, and the storage temperature. Typical warm-up times are given in the table below. Note: Times are based on separating packages to allow for good air circulation. Remove large packages and rolls of film from refrigeration the day before you plan to use them. Keep the relative humidity low. Although the packaging helps to protect the materials from moisture, exposure to a relative humidity (RH) of 60 percent or higher for long periods damages cardboard packages, labels, adhesives, and metal. It also promotes the growth of bacteria, molds, and fungi. Some species of fungi can destroy emulsions by ingesting the gelatin. Usually the relative humidity in refrigerators and freezers is high, so inspect the packaging periodically for signs of deterioration and fungus growth. Use a room dehumidifier to keep the humidity low—ideally below 50 percent RH. After you have opened the original sealed packaging, the material is no longer protected from the damaging effects of high relative humidity and atmospheric contaminants such as chemical fumes. * For this reason, it is important to use the material promptly. *Chemical fumes that can harm photographic products may come from industrial emissions, motor exhausts, paints, solvents, cleaners, mothballs, chipboard, glues, mildew and fungus preventives, foam-injected insulation, fabric treatments such as permanent press and stain inhibitors, and insecticides. These may contain formaldehyde or aldehyde derivatives, sulfides, or other agents that can harm either unprocessed or processed photographic materials. X-rays can fog unprocessed film when the level of radiation is high or when the film receives several low-level doses, because the effects of x-ray exposure are cumulative. Once film has been processed, however, it is not affected by x-rays. When you travel by commercial airline, your checked luggage is usually subjected to x-ray examination. You can avoid this danger to unprocessed film by hand-carrying your supply, including loaded cameras, and requesting a visual inspection. The walk-through and hand-held electronic devices used to check passengers are not x-ray devices and do not affect film. Sometimes mailed packages are also x-rayed; if you include unprocessed film in a package, label the package “Undeveloped Photographic Film. Please Do Not X-Ray.” Film mailed in clearly marked processing mailers sold by photofinishers is usually not subjected to x-ray inspection. Once you have exposed your film, paper, or display material, it is important to minimize changes in the latent (unprocessed) image. For consistent results, process the film, paper, or display material promptly after exposure. This is particularly important with professional color films, because they are optimized for processing soon after exposure. Storage at a low temperature after exposure will retard latent-image changes. You can keep exposed, unprocessed film in a refrigerator for a few days when necessary. Put the film in a sealed container, and allow the unopened container to reach room temperature before removing the film for processing. If you have professional films processed at a distant processing laboratory, ship them by priority mail or air express promptly after exposure. Do not deposit film in a metal mailbox where it may be subjected to high temperatures. For best results, process paper or display material on the same day you expose it. You should not notice shifts in the latent image with keeping times from 1 minute to 24 hours. Therefore, you do not need to change your printing procedures to compensate for latent-image shifts under normal temperature and handling conditions. For consistent results, keep the time between exposure and processing the same for each type of paper or display material. cleaning the tanks regularly to avoid bacterial growth, and using a stop bath when recommended. when stored in the dark, however, color negative images do change. Negatives that you intend to reprint require the same care and attention as other photographic images. Avoid a buildup of fingerprints, dirt, and dust; these contaminants often contain chemicals or fungus spores that can harm the image. If you suspect that your negatives are dirty, clean them carefully before you store them. If you use envelopes or plastic sleeves to protect the negatives, be sure that the material has no potential for harming them. The glossy surface of some plastic sleeves may cause ferrotyping (glazing) of a negative, which leads to density variations in a print made from it. Paper envelopes that meet the standards for photographic materials are better for long-term storage of negatives. Control the temperature and humidity. Negatives intended for long-term storage require special care, but you can store negatives for short-term use under normal room conditions. In climates where the relative humidity regularly approaches 60 percent, use a dehumidifier or other means of reducing the humidity in the storage area. Keep the temperature low for long-term storage. High temperature and high relative humidity can affect processed negatives. A temperature between 2°C (35°F) and 13°C (55°F) and a relative humidity between 30 and 35 percent are excellent conditions for long-term storage of negatives. The storage temperature for black-and-white negatives is not as critical as for color negatives, but you should control the relative humidity. An RH below 25 percent can lead to brittleness; an RH above 60 percent encourages mold and fungus growth. Light affects photographic dyes; for short-term storage, put negatives in a dark place—metal drawers or file boxes, for example. Metal is better than wood or plastic because wood and plastic may contain preservatives or volatile substances that can affect the negatives. Most guidelines for storing other photographic products also apply to prints. The dyes and emulsion layers in color papers make storage of color prints more critical than that of black-and-white prints. Select the print material that best suits your needs. Many factors—light, heat, humidity, and atmospheric contaminants—can affect the life of a print. Even under the best conditions, a print on continuous display is likely to change in time. When prints are intended for display, store the original negatives or slides properly so that you can make new prints if the display prints begin to fade. Because KODAK PROFESSIONAL ENDURA and KODAK ROYAL and EDGE Papers have excellent dye stability, you can expect color prints made on these papers to keep for a long time—many decades for prints on display under typical home lighting, for example. Provide a cool, dry, uncontaminated storage place. If you have prints that you don’t expect to display or that you want to store for a long time before you display them, you may want to leave them unmounted. Avoid storing prints in the original cardboard box or package. Use archivally safe boxes or envelopes. The best storage conditions for color prints are the same as those for most other photographic products. Store prints in the dark at 24°C (75°F) or lower and at 30- to 50-percent relative humidity. If you store several prints in one package, interleave them with acid-free paper. Store prints in albums for convenient access. A less elaborate way to keep prints, and one that combines ready access with good long-term storage conditions, is in a photo album. To get the best results from storage in an album, keep it in a place where the temperature and humidity aren’t excessive. Because the prints are in direct contact with the pages of a photo album, make sure that the materials in the album are suitable for long-term storage of photographs. Check these items—cover, pages, plastic sleeves, mounting corners or hinges, and ink used for identification. Fumes from mothballs, mildew inhibitors, wood preservatives, paints, varnishes, and wood glues can contaminate drawers and harm photographic materials. Therefore, open bookshelves may be a better place to store albums and prints. Mounting board is the most commonly used material for mounting photographs. Most mounting boards designed for photographic use are acid-free and pH-buffered. (Use materials that are not acid-free and pH-buffered only for short-term mounting.) One method of long-term mounting involves attaching the print to conservation board with acid-free paper hinges or corner pockets. These materials are often used with a window mat placed over the photograph. Interleave mounted prints with acid-free paper when you store them. The Film Photography Project On-line Store carries film, chemistry and archival PrintFile sleeves to store your negatives and slides. Please share this blog and write to us!